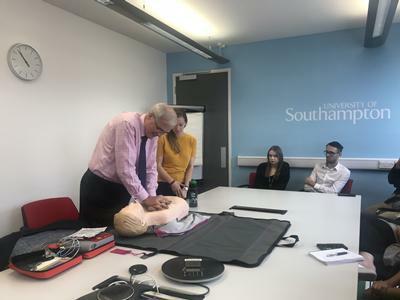 Medical students have been encouraging their fellow classmates and University staff to become more informed about cardiopulmonary resuscitation (CPR) by holding a series of training sessions across campus. 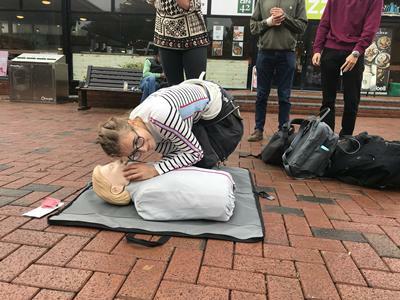 The event was to mark Restart a Heart Day, led in the UK by the Resuscitation Council, which aims to empower as many bystanders as possible, includ­ing non-­professionals, to do chest compressions if they see someone having a heart attack. It is the first year that the campaign has gone global with the aim of training 200,000 people. Research shows that good CPR can be almost as effective as the blood pumping the heart itself. However, the proportion of cardiac arrests in which a bystander attempts CPR, ranges from five to 20 per cent in most countries to more than 60 to 80 per cent in a few countries. If, in all countries, bystanders attempted CPR in at least 50 per cent of cardiac arrests, hund­reds of thousands of lives could be saved worldwide every year. Southampton medical students have been involved in the Restart a Hear Day for three years and this year played a role in organising the event. The sessions took place at various locations across Highfield and Avenue campuses with more than a hundred students and staff taking part including the University President and Vice Chancellor, Professor Sir Christopher Snowden. The event has also received support from ambulance trusts and the British Heart Foundation.